I would like to introduce you to my new “mother’s helper”-the new Mint™ Robotic Floor Cleaner. This revolutionary floor cleaner uses the NorthStar Navigation System (an indoor GPS) that sets up a cleaning grid to map the area that needs to be swept or mopped. Mint™ uses the NorthStar Navigation Cube as a guidance reference point and it automatically cleans up to 1,000 square feet with a dry cloth and 250 square feet when the cleaning cloth is wet. Living in Florida, my three children and boxer seem to constantly track in sand and dirt onto my clean kitchen floor and keeping it clean can be a daunting task. My husband was a bit skeptical about whether or not the Mint™ system would really work but I am pleased to announce that we are both very impressed with its’ performance. It is very easy to set it up and we tried it initially on a clean floor. Mint™ moves in straight lines back and forth across the tile floor and the kids love watching it (they think that it is their new robot pet that they have named “Rosie”) encounter obstacles like the carpet line or the dog food dish and it sensed that it could either go around it and keep cleaning or it turns around and goes in another direction. After watching it work, I noticed that it seems to work in a methodical grid like motion to insure that it cleans all open areas. I particularly like how it finalizes cleaning by sweeping the perimeter area to get those spots close to the wall that I may have missed. When Mint™ has finished cleaning the area it returns to the Navigation Cube and sends out a signal to alert me that it is finished. The first time we cleaned, I had started on what appeared to be a clean floor (I had mopped it the day before and it still looked clean). I used a dry cloth and was horrified to see all of the sand and dirt that Mint™ had picked up on my seemingly clean floor. I use the Sweep Mode every day to keep my floors swept and clean. I also really like the Mop Mode which utilizes a wet cloth, either disposable or re-usable cloths to “dissolve dirt and pull it up into the cleaning cloth and off the floor.” I have gone from mopping my floor by hand 2-3 times per week to only once per week since using Mint™. I am thrilled to be able to use that time more wisely instead of tediously cleaning my floors and it really is like a dream come true. Mint™ is by far my favorite cleaning accessory because it saves valuable time and it really works! You can purchase Mint™ for yourself…….just set it to work, prop your feet up and relax which it cleans. The Mint™ system and additional accessories can be purchased online at the Mint™ online store or you can use the store locator to purchase at Walmart, HSN, Bed Bath and Beyond, Amazon.com and more. 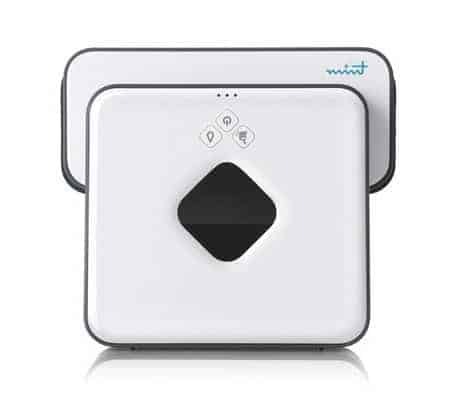 At only $199 for the system, I personally find this investment to be a real bargain because Mint™ is an exceptional cleaning product that is affordably priced for advanced robotic technology. Connect with Mint Cleaner on Facebook and Twitter. Book Review: What’s Eating Your Child?